The airborne was alerted to prevent the North Vietnamese regiments defeated in the Ia Drang Valley from escaping back into Cambodia. I was half asleep in my room at the Manor BOQ after a big meal of curried chicken and beer when the call came to get out to the airport. Truong had assembled an unusually large task force of some two thousand troops to go to the Ia Drang the following morning, and had chosen me as his advisor. We flew in transports to the red clay strip at Duc Co, my old stomping ground, then by chopper south to the river valley. From the minute we stepped off our helicopters we were involved in skirmishes and firefights. The valley was about twelve miles wide at the point where the Ia Drang flowed westward into Cambodia-and somewhere in those miles of dense jungle the main body of the enemy was on the move. We had landed to the north, and Truong ordered the battalions to cross the Ia Drang and take up positions along the Chu Prong Mountains, which formed a series of steep ridges to the south. It was fascinating to watch him operate. As we marched, he would stop to study the map, and every once in a while he'd indicate a position on the map and say, "I want you to fire artillery here." I was skeptical at first, but called in the barrages; when we reached the areas we found bodies. Simply by visualizing the terrain and drawing on his experience fighting the enemy for fifteen years, Truong showed an uncanny ability to predict what they were going to do. When we set up our command post that night, he opened his map, lit a cigarette, and outlined his battle plan. The strip of jungle between our position on the ridges and the river, he explained, made a natural corridor-the route the NVA would most likely take. He said, "At dawn we will send out one battalion and put it here, on our left, as a blocking force between the ridge and the river. Around eight o'clock tomorrow morning they will make a big enemy contact. Then I will send another battalion here, to our right. They will make contact at about eleven o'clock. I want you to have your artillery ready to fire into this area in front of us," he said, "and then we will attack with our third and fourth battalions down toward the river. The enemy will then be trapped with the river to his back." I'd never heard anything like this at West Point. I was thinking, "What's all this about eight o'clock and eleven o'clock? How can he schedule a battle that way? " But I also recognized the outline of his plan: Truong had reinvented the tactics Hannibal had used in 217 B.C. when he enveloped and annihilated the Roman legions on the banks of Lake Trasimene. But, Truong added, we had a problem: the Vietnamese airborne had been called into this campaign because of high-level concern that American forces in pursuit of the enemy might otherwise venture too close to the Cambodian border. He said, "On your map, the Cambodian border is located here, ten kilometers east of where it appears on mine. In order to execute my plan, we must use my map rather than yours, because otherwise we cannot go around deeply enough to set up our first blocking force. So, Thieu ta Schwarzkopf"-thieu ta (pronounced "tia-tah") is Vietnamese for "major"-"what do you advise?" The prospect of letting an enemy escape into a sanctuary until he was strong enough to attack again galled me as much as it would any soldier. Some of these fellows were the same ones I'd run into four months earlier at Duc Co; I didn't want to fight them again four months from now. So why should I assume that my map was more accurate than Truong's? "I advise that we use the boundary on your map." Long after he'd issued his attack orders, Truong sat smoking his cigarettes and studying the map. We went over the plan again and again late into the night, visualizing every step of the battle. At dawn we sent out the 3rd Battalion. They got into position and, sure enough, at eight o'clock they called and reported heavy contact. Truong sent the 5th Battalion to the right. At eleven o'clock they reported heavy contact. As Truong had predicted, in the jungle below us the enemy had run into the 3rd Battalion at the border and decided, "We can't get out that way. We'll double back." That decision violated a basic principle of escape and evasion, which is to take the worst possible route in order to minimize the risk of encountering a waiting enemy. Had they climbed out of the valley up the Chu Prong Mountains, they might have gotten away. Instead they followed the low ground, as Truong had anticipated, and now we'd boxed them in. He looked at me and said, "Fire your artillery." We shelled the area below us for a half hour. Then he ordered his two remaining battalions to attack down the hill; there was a hell of a lot of shooting as we followed them in. Around one o'clock, Truong announced, "Okay. We'll stop." He picked a lovely little clearing, and we sat down with his staff and had lunch! Halfway through the meal, he put down his rice bowl and issued some commands on the radio. "What are you doing?" I asked. He'd ordered his men to search the battlefield for weapons: "We killed many enemy, and the ones we didn't kill threw down their weapons and ran away." Now, he hadn't seen a damn thing! All the action had been hidden by jungle. But we stayed in that clearing for the remainder of the day, and his troops brought in armful after armful of weapons and piled them in front of us. I was excited-we'd scored a decisive victory! But Truong just sat, smoking his cigarettes. General Schwarzkopf was mesmerized by LTC Truong's ability to sense the enemy's positions, while he did not see a damn thing. Each time Truong gave him order to fire artillery into the jungles, it was with pinpoint accuracy. Furthermore, he could not figure out why was it possible for Truong to anticipate the enemy troops' withdrawal paths, then to block them at two ends in order to box them in against the Ia Drang River. Major Schwarzkopf of the year 1965 and even General Schwarzkopf of nowadays - he published his memoir in 2002 - assumed with naïveté that Simply by visualizing the terrain and drawing on his experience fighting the enemy for fifteen years, Truong showed an uncanny ability to predict what they were going to do. If in fact LTC Truong, upon receiving order to bring his troops from Saigon to the Highlands in search of enemy troops on their withdrawal to Kampuchea, selected on his own the landing zones amidst the vast jungles of Chu Pong massif, sniffed out on his own the enemy troops on the move, anticipated on his own the enemy's withdrawal paths and set up accurate ambush sites, the ways Major Schwarzkopf depicted, then Truong was indeed an exceptional commander with a uncanny and unmatched sixth sense. However, the reality was not as such. General Schwarzkopf was naïve in thinking that LTC Truong acted on his own when he lead the Vietnamese airborne battalions in the Than Phong 7 Operation(*). In reality, he merely executed orders issued from II Corps General Staff from the outset through the conclusion of this operation. It is unthinkable that LTC Truong could have possessed the superhuman ability to sensing the enemy troops on the move under the cover of the dense canopies in the vast Chu Pong massif areas. Let's unveil the mystery curtain of the magic show that mesmerized General Schwarzkopf in the Ia Drang valley in 1965, by filling the gaps in his account that is a product of nebulous memory with precise details on dates, coordinates and numbers provided by the II Corps Chief of Staff in his after action report Why Pleime. On November 17, 1965, II Corps Command analyzed intelligence and estimated that nearly 2/3 of enemy's strength had been wiped out through battles at Pleime and Chu Pong lasting from October 29 to November 11. II Corps Command had also requested the US Army to have B-52 airplanes systematically bomb the Chu Pong massif from West to East from November 15 to 19, shutting off the back door to Cambodia, leaving open only a narrow escape corridor at the valley of Ia Drang for the two remnant 635th and 334th NVA Battalions of 32nd NVA Regiment. Meanwhile, II Corps Command kept on inserting teams of Special Forces Rangers deep into enemy troops' territories to monitor their movements. These Special Forces Rangers teams acted as LTC Truong's eyes and ears. On November 18, within a few hours, II Corps Command had huge transport airplanes C-130 of 7th US Air Force airlift the Airborne Brigade Headquarters, the Airborne 1st Task Force Headquarters with its three Airborne 3rd, 5th and 6th Battalions, and the Airborne 2nd Task Force Headquarters with its two Airborne 7th and 8th Battalions, spread out in Saigon, Bien Hoa, Vung Tau and Phu Yen into Pleiku. 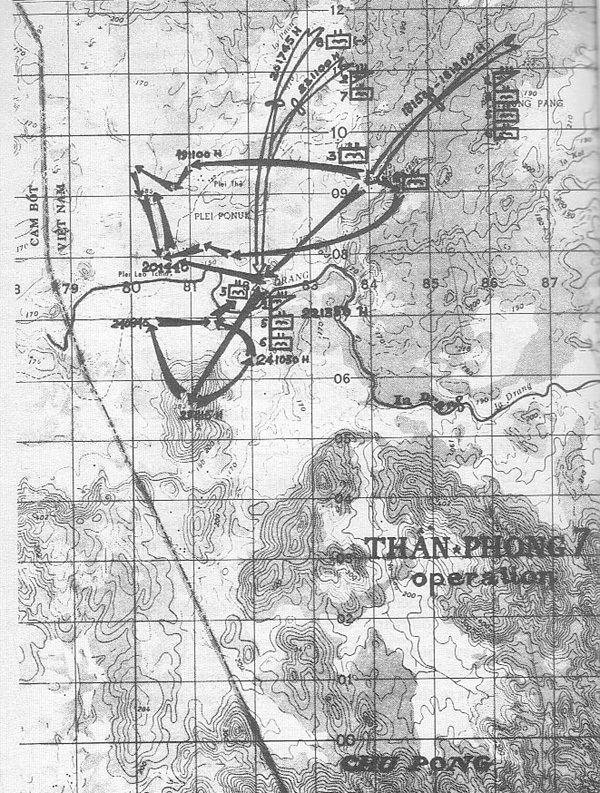 At II Corps Headquarters, Colonel Hieu briefed the designed plan of Than Phong 7 Operation(*) to LTC Truong, pointed out to him the unique escape route the Viet Cong would used to sneak back to Cambodia and presented to him a tactical map drawn up by G3/II Corps - the map with the borderline at odds with the one carried by Major Schwarzkopf from Saigon. Colonel Hieu also advised LTC Truong that the operation would be supported by artillery from US 1st Air Cavalry set up at LZ Columbus and LZ Crooks nearby, the first about 11 kilometers southeast and the second about 7 kilometers northwest of his operational area. On November 18, from 3:00 p.m. to 6:00 p.m., Airborne 1st Task Force Headquarters and its three Airborne 3rd, 5th and 6th Battalions were helilifted to landing zone (X84, Y09) on the northern part of Ia Drang River. Airborne 3rd Battalion and Airborne 6th Battalion immediately set out to sweep for the enemy westward in two different axes. While on the move, Airborne 3rd Battalion was tipped off by Special Forces Rangers teams that a battalion sized enemy force belonging to NVA 32nd Regiment was shadowing it. On November 19, around 11:00 a.m., Airborne 3rd Battalion received order to veer south toward an ambush site set up at (X80, Y08) by Airborne 6th Battalion. On November 20, at 2:40 p.m., the enemy troops entered the very center of the ambush and was caught within the field of fire of Airborne 6th Battalion. The enemy suffered about 200 casualties in this engagement. Furthermore, in their sweep, Airborne 3rd Battalion and Airborne 6th Battalion had destroyed 3 training centers, one equipment cache and 75 houses. On November 20, at 5:45 p.m., Airborne 8th Battalion was helilifted to location (X82, Y07), to prepare for the insertion of Airborne 2nd Task Force Headquarters along with Airborne 7th Battalion at 11:00 a.m. On November 22, the units already present on the battlefields - Airborne 1st Task Force Headquarters, Airborne 3th Battalion, Airborne 5th Battalion, and Airborne 6th Battalion converged toward location (X82, Y07); by 1:50 p.m. on November 22, all units were reunited at this staging area. 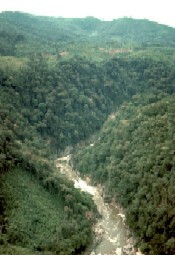 From here, the entire Airborne Brigade crossed to the south side of Ia Drang River and climbed up a mountain and reached its peak at (X81, Y06) around 11:15 a.m. on November 23. They settled down for the night in preparation to ambush the enemy troops at the corridor that II Corps Command had predicted the enemy would utilize to withdraw back to Cambodia the next day. On their journey up the mountain, each time enemy positions were tipped off by Special Forces Rangers teams, LTC Truong gave order to Major Schwarzkopf to call in artillery fire on the enemy troops hiding ahead of his advance. Early morning on November 24, LTC Truong sent Airborne 3rd Battalion to his left to intercept the enemy troops. This battalion made contact with the enemy at 8:45 a.m.; the enemy troops reversed their steps. LTC Truong sent Airborne 5th Battalion to his right. This battalion made contact with enemy troops at 10:50 a.m. The enemy troops were caught in between two blocking positions. LTC Truong gave order to Major Schwarzkopf to fire his artillery on the enemy for a while - approximately half an hour - then launched Airborne 7th Battalion and Airborne 8th Battalion down the mountain and boxed them in against the Ia Drang River. In this engagement, the enemy lost about 65 killed and left behind 58 weapons of various types. Grant that General Schwarzkopf was present at Than Phong 7 Operation. Nevertheless, his participation was still of an outsider. He only saw the actions happening on the stage, but was unaware of all that was going on behind the scenes. Although he was, and still is, a military man, he seems not able to differentiate between the two aspects of control and command of a military operation: LTC Truong was in command of the operation, but he was remotely controlled by II Corps Command. Furthermore, he was unaware of active participation of the ARVN Special Forces Rangers in the operation. They operated in top secret missions and their activities were rarely mentioned in official military documents - American and Vietnamese alike. As a matter of fact, one has to rely on a Việt Cộng's document to come to know about the stealthy role of ARVN Special Forces Rangers in the battle of Pleime-ChuProng-IaDrang. - Thần Phong 3, a road clearing operation of National Highway QL 21, from 08/19 to 09/02/1965. - Thần Phong 6 commenced in Binh Dinh Province in mid-October 1965 and terminated in Quang Duc Province on October 24 1965, while the Pleime Battle was unfolding. 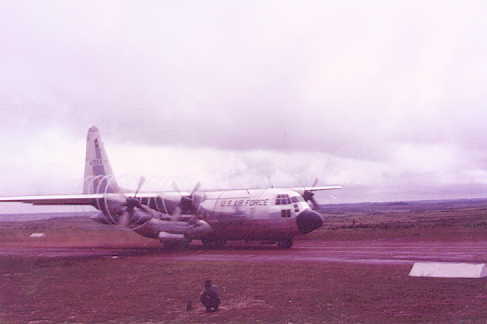 - on 5/11/2011: Entry of G3 Journal/IFFV, on 11/19/1965 at 16:55H, indicated that ARVN Airborne Brigade operated under G3/II Corps' direct tactical control during Than Phong 7 operation: "Fwd CP states the elem's in Abn TF area was coordinated at higher levels than Fwd G3. The Abn TF knows about it." - on 1/17.2015: The main source of intelligence that provided the real time military situation of the enemy troops was the radio intercept of opened communications in Mandarin between Chinese advisors. It allowed Colonel Hieu to hold LTC Truong's hand in the setting and execution of the two ambushes with such precision). - on 1/12/2019: Further examination of documents indicated that the intelligence about the precise positions of the enemy troops were tipped off more likely by the radio intercepts of communications of Chinese Advisors embedded with VC combat units and at headquarters established in Phnom Penh, Cambodia, than by the special forces rangers: ''The natural corridors often mentioned by General Delange in 1951 would not be efficient without the existence of Cambodia, without the concealment of Red Chinese advisors who enjoyed full amenities living in Phnom Penh, without the excellent communication by ways of telephone and airgram between Phnom Penh and Hanoi " (Pleime, Trận Chiến Lịch Sử, page 172).